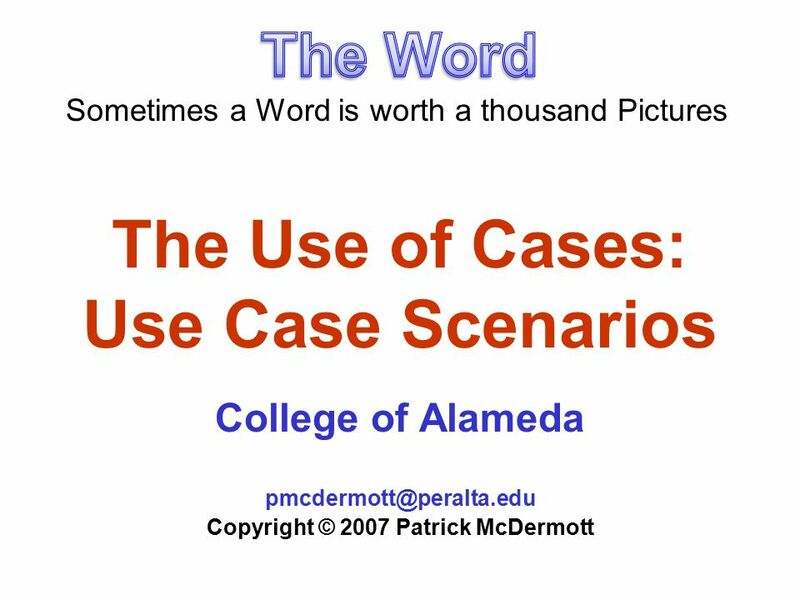 The Use of Cases: Use Case Scenarios College of Alameda Copyright © 2007 Patrick McDermott Sometimes a Word is worth a thousand. 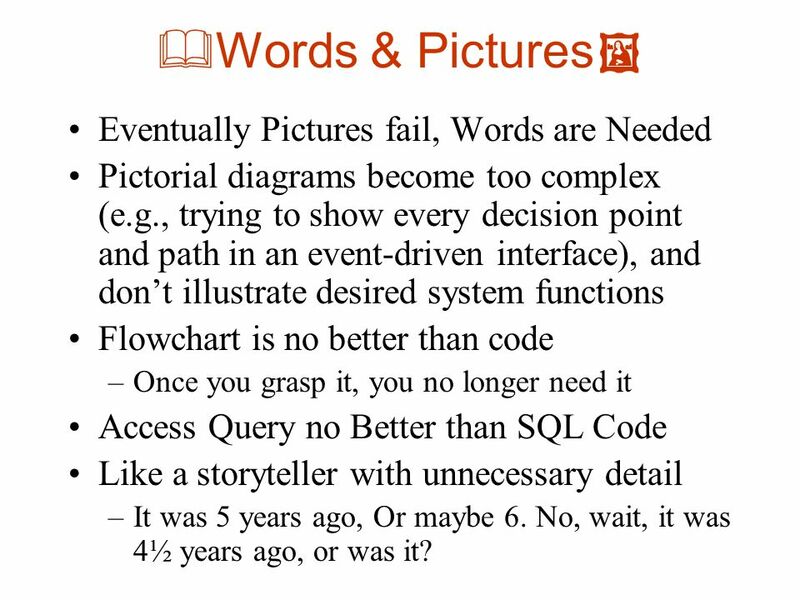 3  Words & Pictures  Eventually Pictures fail, Words are Needed Pictorial diagrams become too complex (e.g., trying to show every decision point and path in an event-driven interface), and don’t illustrate desired system functions Flowchart is no better than code –Once you grasp it, you no longer need it Access Query no Better than SQL Code Like a storyteller with unnecessary detail –It was 5 years ago, Or maybe 6. No, wait, it was 4½ years ago, or was it? 5 What’s a Use Case Scenario? 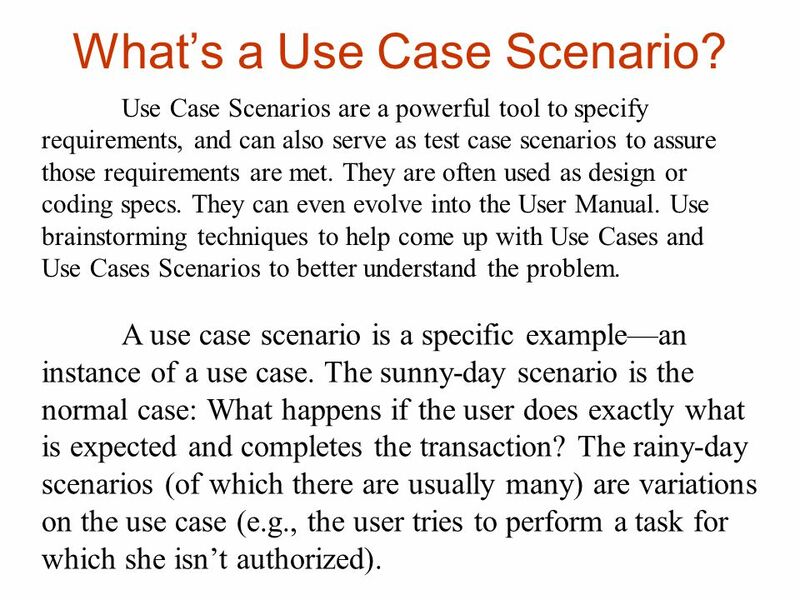 A use case scenario is a specific example—an instance of a use case. 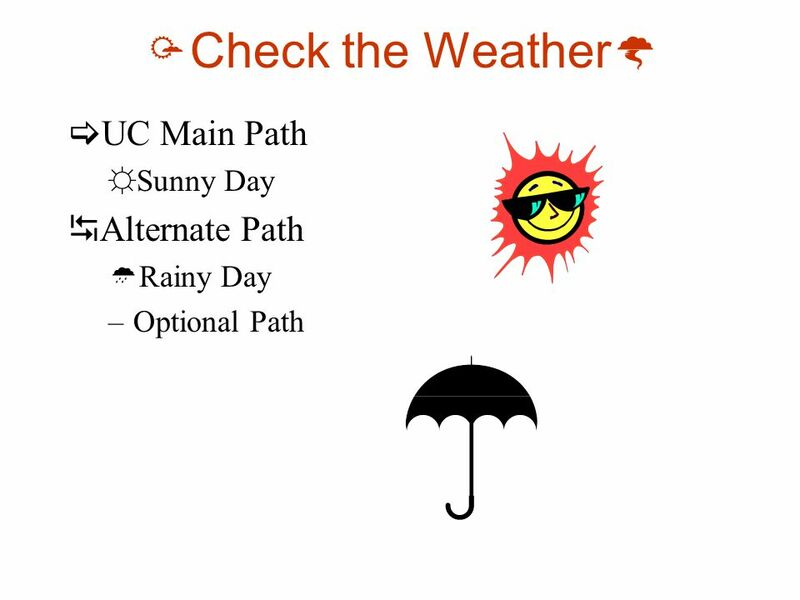 The sunny-day scenario is the normal case: What happens if the user does exactly what is expected and completes the transaction? 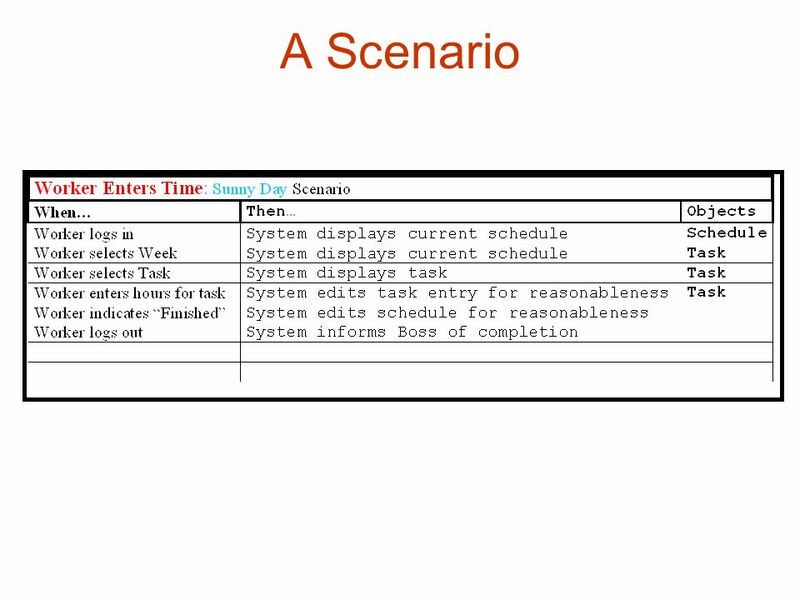 The rainy-day scenarios (of which there are usually many) are variations on the use case (e.g., the user tries to perform a task for which she isn’t authorized). 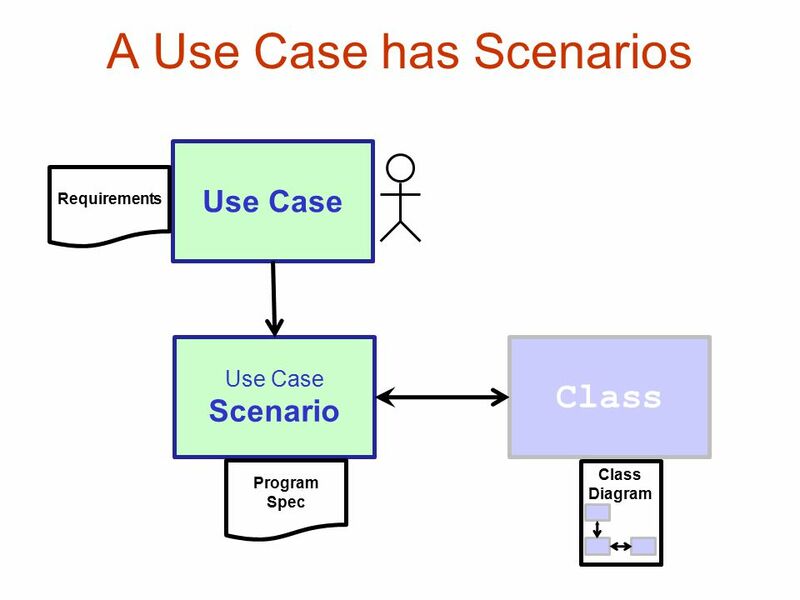 Use Case Scenarios are a powerful tool to specify requirements, and can also serve as test case scenarios to assure those requirements are met. They are often used as design or coding specs. They can even evolve into the User Manual. Use brainstorming techniques to help come up with Use Cases and Use Cases Scenarios to better understand the problem. 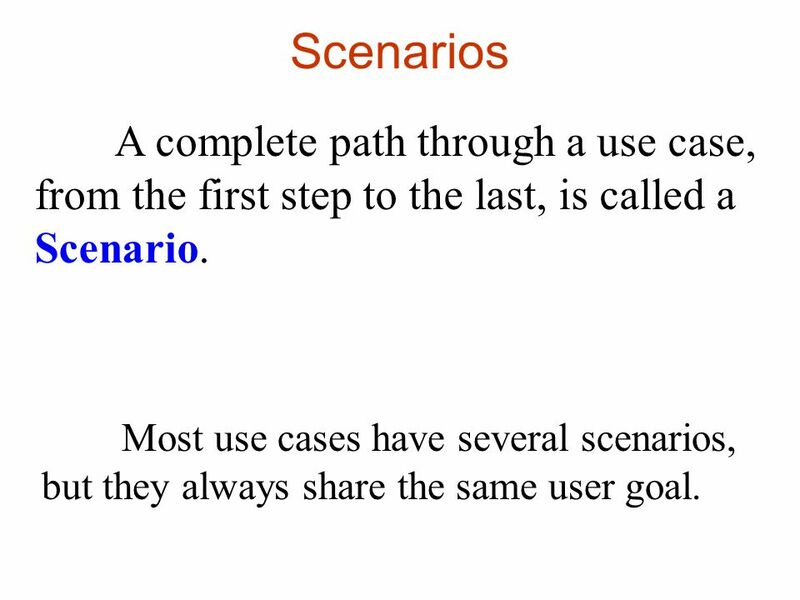 6 Scenarios A complete path through a use case, from the first step to the last, is called a Scenario. 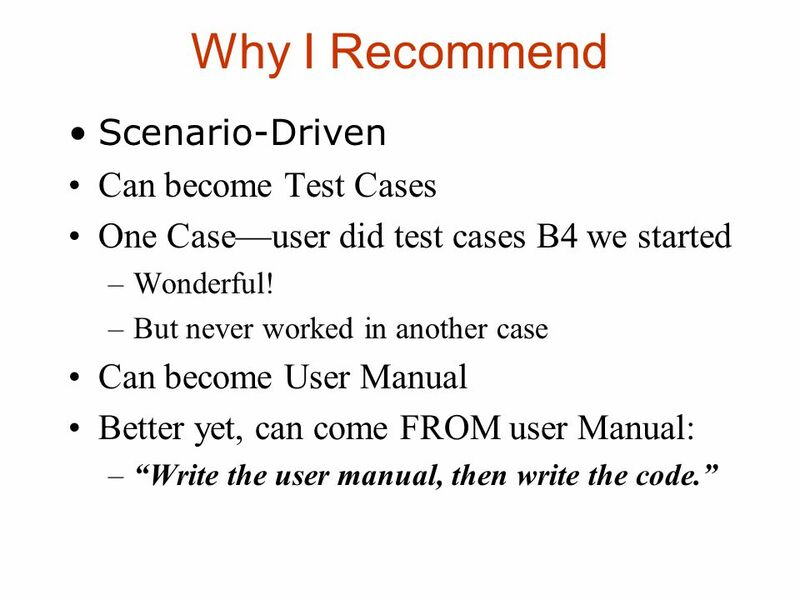 Most use cases have several scenarios, but they always share the same user goal. 10 Use Case Scenario Note that one use case is a collection of several use case scenarios. A use case might be Register Vehicle. Four scenarios: Register New Vehicle, Register Out- of-State Vehicle, Re-Register Existing Vehicle, Register Stolen Vehicle. We’ll use “step” to refer to the lower level items: they are called steps on our diagrams and are portrayed as boxes, but the individual workers often call them tasks, or activities. 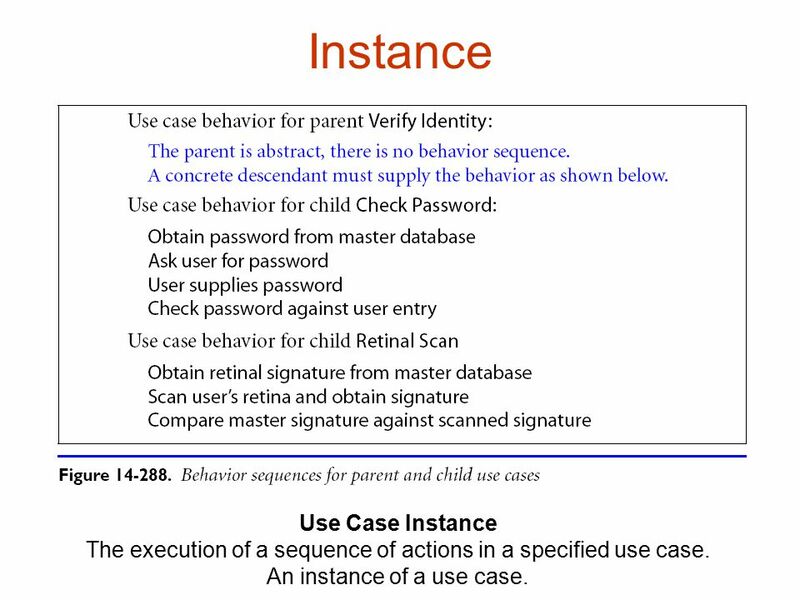 12 Instance Use Case Instance The execution of a sequence of actions in a specified use case. An instance of a use case. 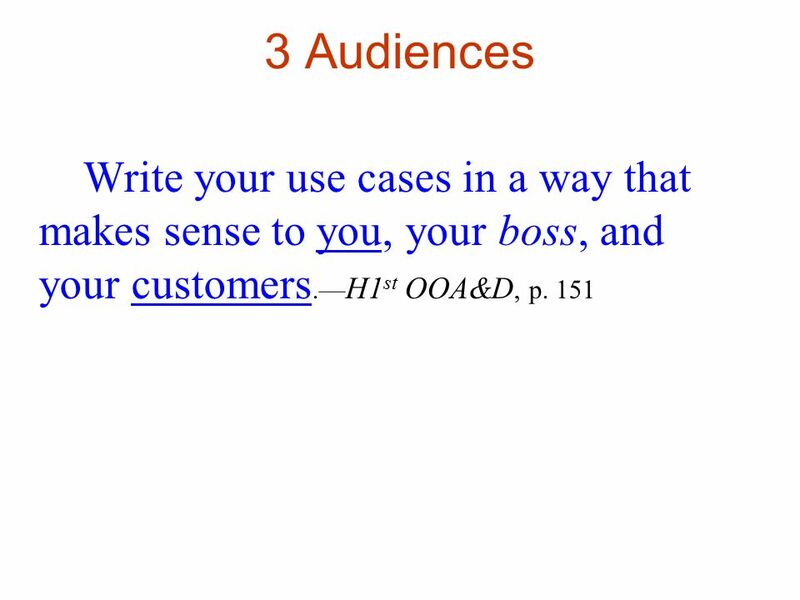 Download ppt "The Use of Cases: Use Case Scenarios College of Alameda Copyright © 2007 Patrick McDermott Sometimes a Word is worth a thousand." Int 2 Computing Software Development. Introduction to Rational Rose 2000 v6.5 Copyright © 1999 Rational Software, all rights reserved 1 Rational Rose 2000 Interaction Diagrams. Exceptions1 Syntax, semantics, and pragmatics. Exceptions2 Syntax, semantics, pragmatics Syntax –How it looks, i.e. how we have to program to satisfy. 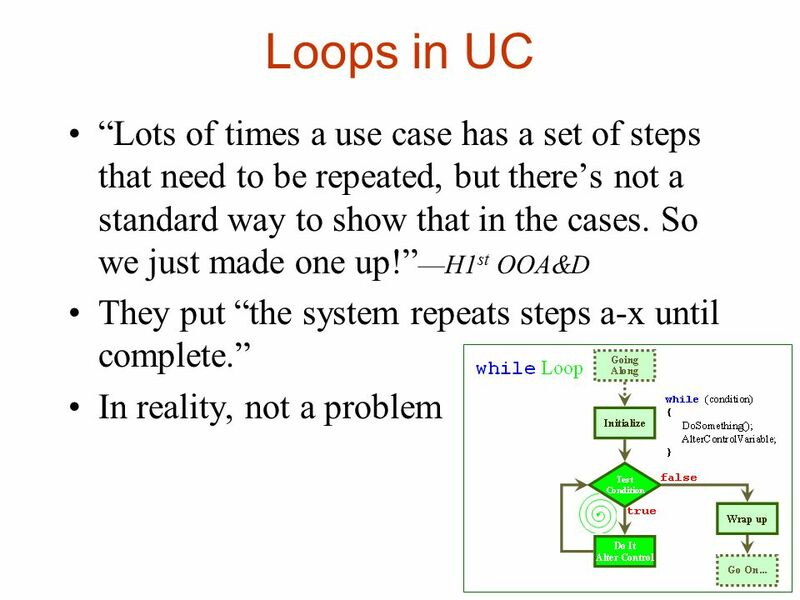 OOAD Using the UML - Use-Case Analysis, v 4.2 Copyright  Rational Software, all rights reserved 1/18 Use Case Analysis – continued Control Classes. 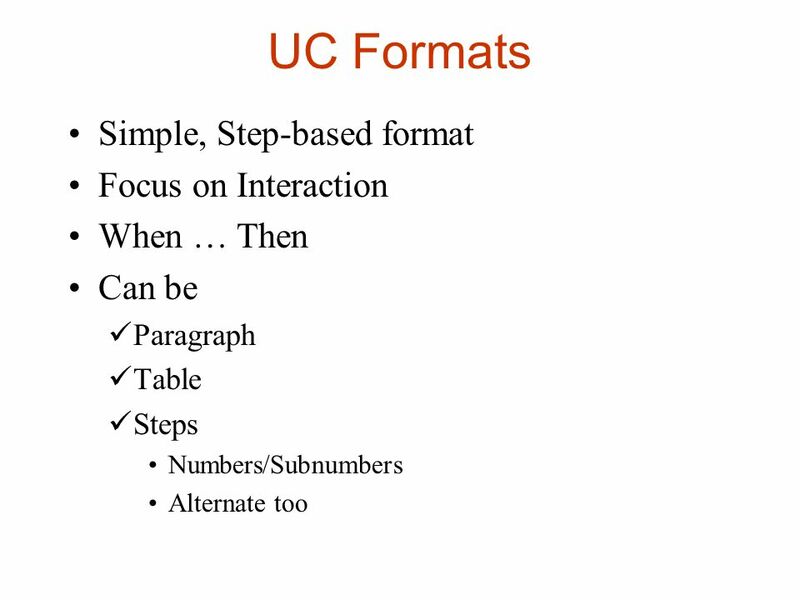 Lecture 2Slide 1 Event Driven Computing Basic Interaction Handling –Interactive programs - must pay attention to the user interface. 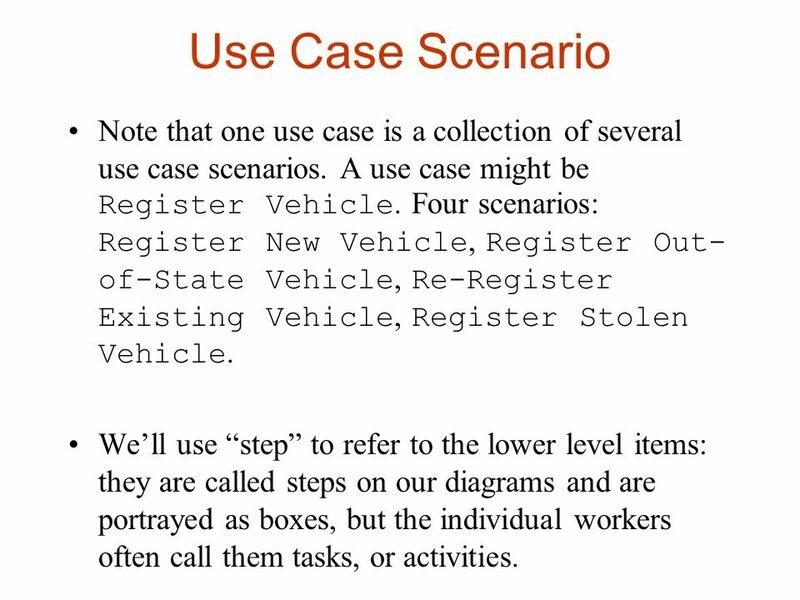 Use Case Modeling Written by: Zvika Gutterman Adam Carmi. Chapter 10 System Sequence Diagrams. What is a System Sequence Diagram? A way of modeling input and output events related to systems It is a picture that. Use cases and requirement specification - 1 Use case diagrams 3 use cases System boundaries Remember: Use case diagramming is a tool, not the requirements. 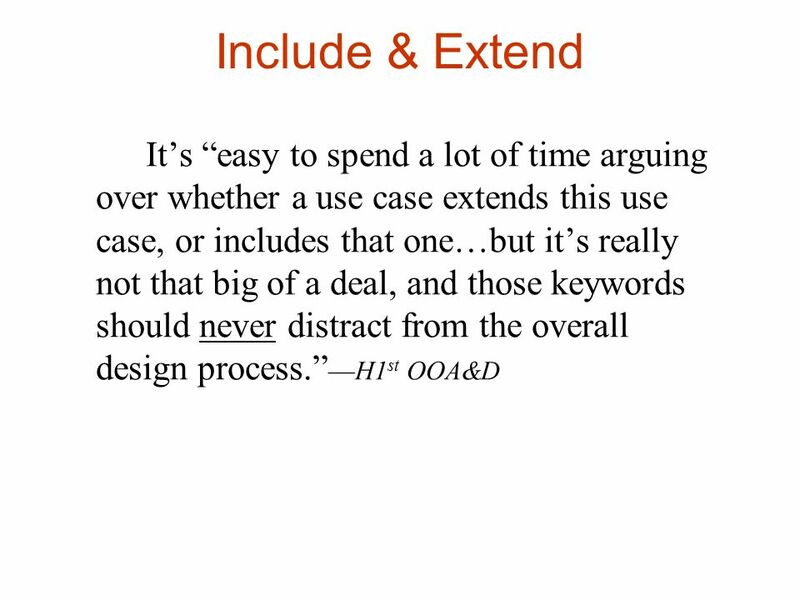 A use case describes one “case” of how a user can use the system. Lesson-21Process Modeling Define systems modeling and differentiate between logical and physical system models. Define process modeling and explain its. 1 Business Models Modeling. 2 Why Model the Business Business modeling is a technique to help answer critical questions, such as: What do the workers.